2013 was the 70th anniversary of the death of Jean Moulin, hero of the Résistance, but it was also 70 years since his greatest triumph. On 27 May 1943, the inaugural meeting of the Conseil National de la Résistance took place in occupied Paris, largely thanks to Moulin’s work. Born in Béziers in 1899, Jean Moulin had grown up wanting to be an artist, but for practical reasons he turned to politics. In 1938 he joined the Aveyron prefecture as France’s youngest prefect. The young man still kept up his artwork throughout his political career, publishing his political caricatures under the pseudonym Romanin. 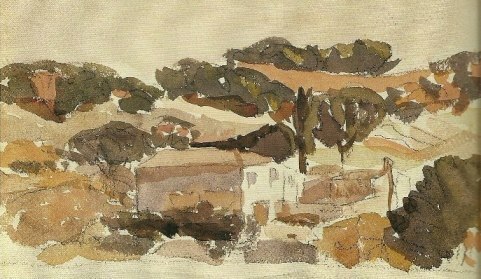 A fine example of his watercolour work can be seen below, a painting of his red-tiled mas in Provence. When war broke out, Moulin was determined to fight and immediately enlisted, however he was such a trusted administrative figure that he was ordered to return to his post in the Eure-et-Loir. When France was invaded, Moulin stayed in his post and did all he could to assist the refugees flocking into his region. He was arrested by the Nazis in June 1940. While under arrest he was asked to sign a paper falsely accusing Senegalese troops in the French army of slaughtering innocent civilians. He refused and was tortured, eventually cutting his own throat rather than give in to his persecutors. His suicide attempt failed and he was released to hospital and afterwards returned to his post at the Prefecture. 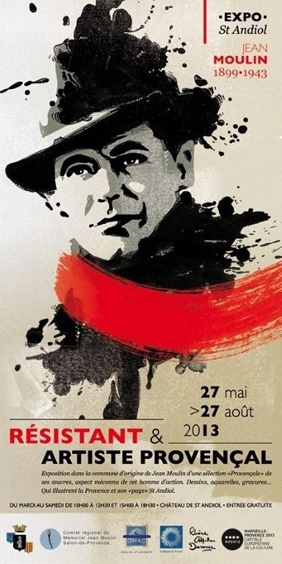 To this day, the most iconic image of Jean Moulin shows him wearing a scarf, which covers his scar. In November 1940 Moulin was dismissed by the Vichy government. During the following year, he assumed a false identity and settled as a farmer in the Bouches-du-Rhône. He also spent several months in Marseille, where he made contact with burgeoning Resistance networks. Many of the future resistance leaders had converged in the port city at one point or another since the summer of 1940, and Moulin met with them, gathering information he could take back to London. While in London, Moulin reported on the embryo resistance groups he had come across and pressed the need for overall command from London. De Gaulle and Moulin, despite their different social and political backgrounds, hit it off immediately and understood each other. Importantly, despite de Gaulle’s reservations, Moulin saw no problem in accepting help from SOE. So, the so-called ‘recruitment’ of Moulin was counted as a major success for RF Section! Moulin became a confirmed gaullist, though he did not formally enlist with la France Libre until his next visit to London one year later. Moulin left London during the night of 1/2 January 1942, on mission REX, with the title of ‘Représentant et délégué du général de Gaulle pour la zone sud’. His mission was threefold: develop propaganda, help to build pockets of paramilitary activity and unite the resistance under the command of the London Free French. Over the following months, he achieved a great deal, supplying the Resistance movement with a centralised point of control, which helped them to link up with London and divide financial aid more easily. He also managed to bring together the heads of the three main Resistance movements: Emmanuel d’Astier de la Vigerie (Libération), Henri Frenay (Combat), and Jean-Pierre Lévy (Francs-Tireurs), as well as General Delestraint, the head of the Armée secrète. Bringing these groups together was no easy task at a time of such high political tension. The unification of the Resistance was sped up by the Allied landings in Morocco and Algeria, and Moulin took advantage of this by merging the three main groups into the Comité Directeur des Mouvements Unis de la Résistance (MUR) in January 1943. At a decisive time in the fighting, Jean Moulin had succeeded in making these groups agree to come together under one command. In February, Moulin and Delestraint returned to London to see de Gaulle and while there de Gaulle presented him with his Croix de la Compagnon de la Libération. Moulin visited 1 Dorset Square again, as we can see from minutes of one of the meetings, the one held there on 22 February. (Click here to see the minutes.) He met with Lt Col. James Hutchison, head of RF Section, as well as Captain Bienvenüe of the BCRA and various others, to discuss supplies, equipment and personnel. Moulin returned to France in March 1943 with instructions to form the Conseil National de la Résistance. His task was to be a difficult one given that the five resistance movements (in addition to the three already on board) each wanted to maintain its own authority and independence. The heads of the movements were reluctant to become involved with the gaullists, as these movements, created in the aim of liberating their country, had in their minds replaced political parties, discredited by France’s defeat. The stage was set for the group’s first meeting, which took place in Paris on 27 May 1943, chaired by Moulin. This was the first time that resistance movements and politial groups, both from the northern and southern zones, had come together in de Gaulle’s name. The meeting was vitally important in that it gave him increased legitimacy with the Allies, and for the first time, he could be considered the sole political head of France involved in combat. 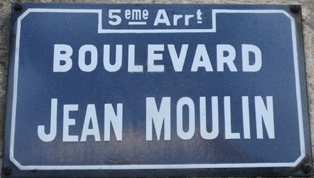 Just one month later, on 21 June 1943, Moulin was arrested during a meeting of Resistance leaders in a suburb of Lyon. He was interrogated there and in Paris by the Gestapo. When they ordered him to write down the names of key resistance figures, Moulin, ever the artist, caricatured the feared Klaus Barbie, his interrogator. He died presumably on 8th July 1943, from the injuries sustained by weeks of torture while being taken to a concentration camp. He had not revealed anything. The Resistance could carry on, and so could his colleagues at 1 Dorset Square. 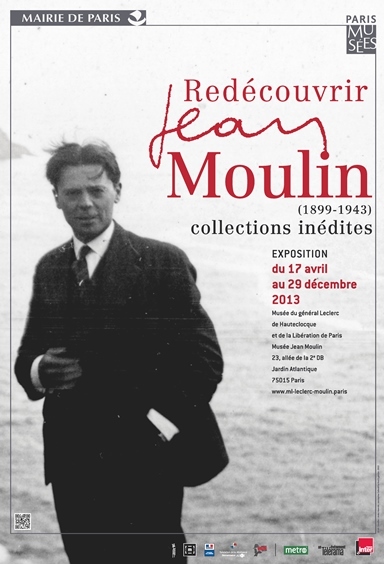 À Paris: Du 17 avril au 29 décembre 2013, exposition "Redécouvrir Jean Moulin, collections inédites (1899-1943)" au Musée du Général Leclerc de Hauteclocque et de la Libération de Paris - Musée Jean Moulin, 75015.
photos credits with thanks: watercolour Le Mas by J. Moulin, Musées de la Ville de Béziers; street plaque by CH; minutes of a meeting at 1 Dorset Square with the kind permission of Musée de l’Ordre de la Libération, Paris; exhibition poster © Coll. Escoffier.